We have all heard that old saying “Fail to plan, plan to fail.” It really is true when it comes to eating a healthy diet. When you no longer rely on processed foods it does require some prep and cooking ahead so you always have something to make a meal from. At first it might seem a little daunting but once you make the mental shift and create a strategy it all starts to seem so simple. Our meals these days are much easier and I actually spend less time preparing meals which frees me up to do other things that are a lot more fun. Like bike riding, hiking and reading books! Food is no longer used as entertainment around here but rather as fuel for our bodies. That doesn’t mean we don’t like good food anymore – quite the contrary – we actually enjoy our food more than ever before. 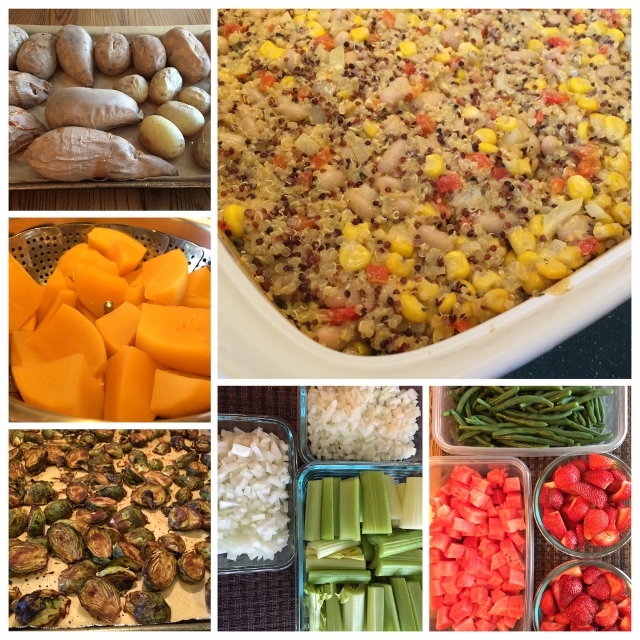 Today I share with you a food prep day from earlier this week. A sheet pan of baked potatoes. At least once a week I bake up a sheet pan full of a variety of potatoes. 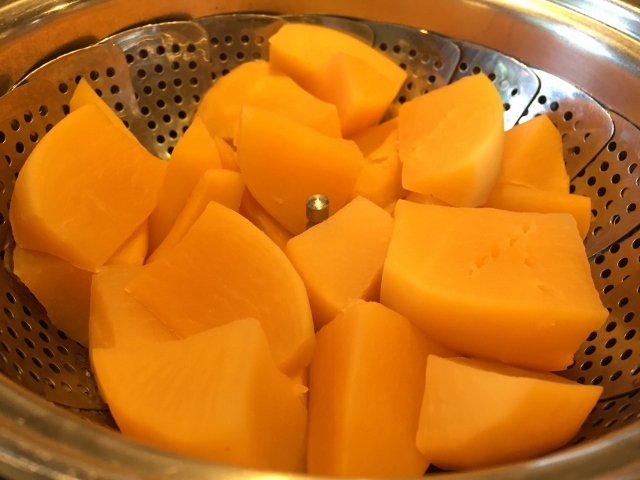 This week it was Organic Yukon Gold potatoes, organic sweet potatoes, organic Japanese Sweet Potatoes and organic russets. Just pop them into a 400 degree pre-heated oven for an hour then pull out baking sheet and remove the smaller potatoes that are done. The larger potatoes usually take about 20 – 30 more minutes. When they have cooled completely they get placed in containers for the fridge. These can be eaten all week long. We will top some of them with plant based stew, soup or chili. Some will be made into oven fries using the Jeff Novick method. 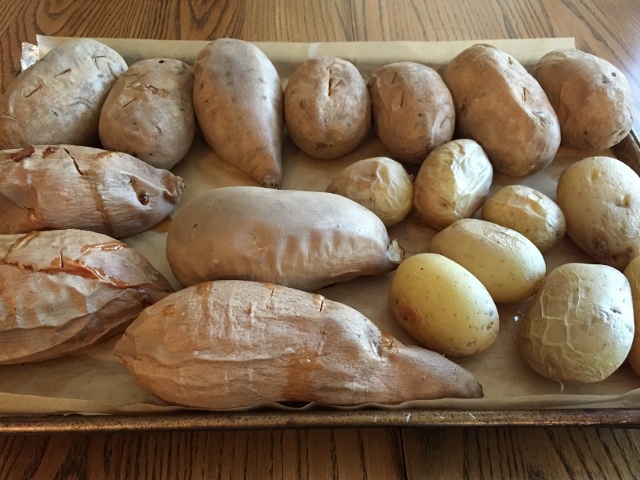 Just slice any of them including the sweet potatoes into wedges, season with no salt seasoning. Place on a baking sheet and broil until golden brown. Delicious! Slices of potato are wonderful dipped into hummus. The sweet potatoes make a lovely sweet dessert either cold or slightly warm sprinkled with cinnamon and freshly grated nutmeg. While the potatoes are cooking I work on other food prep. Costco sells these large bags of fresh green beans that are already trimmed and ready to cook. I think it’s about 2 pounds and we can go through them in just a few days. 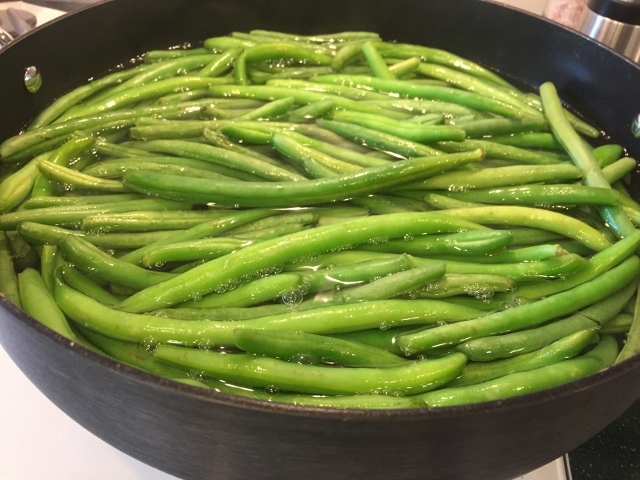 I usually just boil some water in my large skillet and toss in the green beans, set the timer for 6 minutes. When the time goes off I drain the green beans and plunge them into a bowl of ice water to stop the cooking process. Drain them again and put them in a container for the fridge. They can be gently reheated later as a side dish. They can be cut and tossed into salads or “hippie bowls,” eaten as is for snacks plain or dipped in salad dressing or hummus. They make a great movie snack! Perfect to add to soups or stir fries. 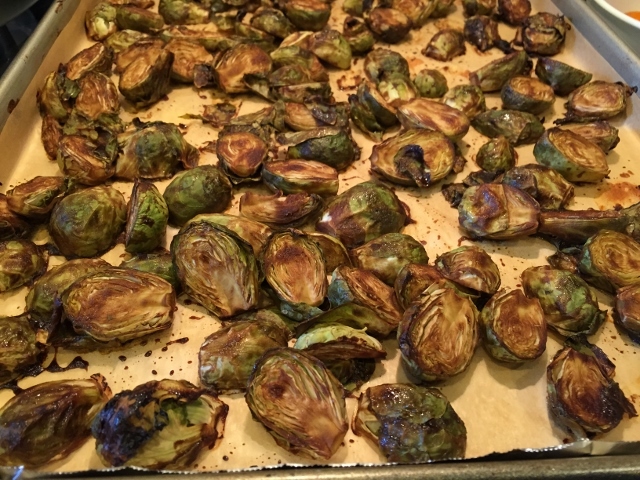 At least twice a week I make a double batch of Chef AJ’s Oven Roasted Brussels Sprouts. They are to die for! Seriously addictive and habit forming! They are incredible hot or cold – I could make a meal out of them but I usually eat them as a side dish. You can watch a Chef AJ Video here and see the recipe. Add these to a plate of BBQ Lentil Muffins and a baked potato for a fabulous meal that is company worthy. 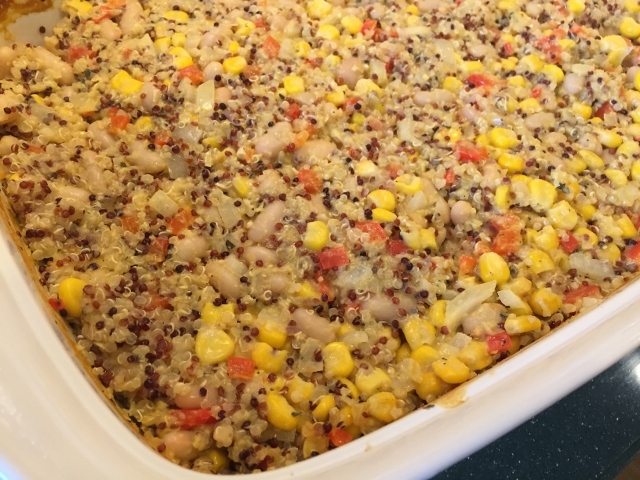 On this particular food prep day instead of a soup, stew or chili I opted to make Dreena Burton’s Corn Chowder Quinoa Casserole. It fills a 9 x 13 pan so we get a few meals out of it. Just omit the oil and salt. You can use more broth and less almond milk if you wish. This is from the “Let Them Eat Vegan” cookbook which is one of my favorite plant based cookbooks. You can also view the recipe here. Rutabagas are very similar to potatoes but not as starchy. I love the flavor and just look at that color! Peel them and steam or boil them. Serve as a side dish like you would potatoes. They are also very tasty mashed. This was two big rutabagas. 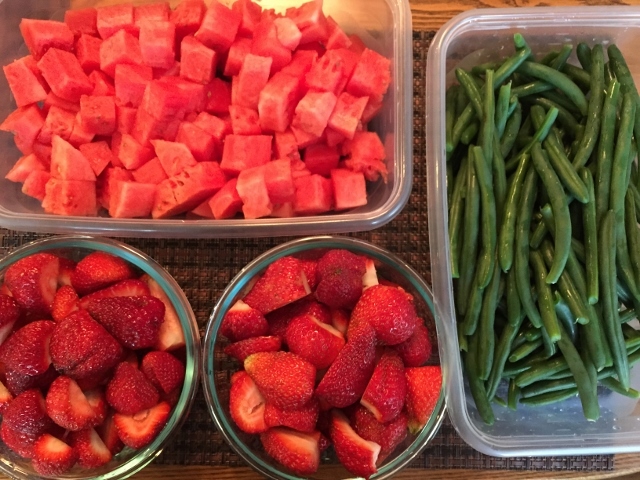 The fresh organic strawberries from the Farmer’s Market were rinsed and sliced, watermelon was cubed and these are the prepped green beans ready for the fridge. I have found that if I prep the fruit in advance it gets eaten more readily than if it just stored in the fridge left whole. Since I had to chop some onion for the casserole I went ahead and chopped the whole onion so it’s ready to be used later in the week in other recipes. 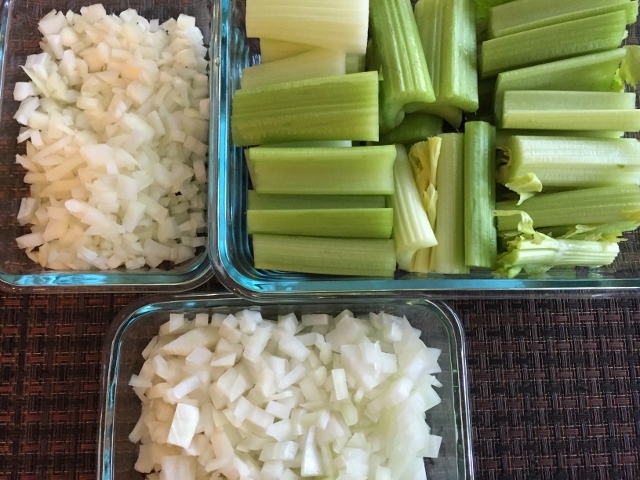 Organic celery was washed and cut so we can use it for recipes or as dippers for hummus. Here is photo collage so you can see it all together. This took about 2 hours but I was chatting with my family while I worked so the time flew by. Just look at all the amazing healthy food that is ready to eat! Food prep ready for the fridge. Here it is all stored in containers and ready for the fridge. The see through containers are nice because you can easily see at a glance what you have ready to eat. In addition to these items, the day before I made some some salad dressing ahead for the week. I always put some in a little jar that I can just grab and take with me in case we decided to eat a salad at Whole Foods or a local restaurant. I fyou are in the Chef AJ Ultimate Weight Loss Facebook group this is Wendy’s Light Balsamic dressing that is in the files on the group page. 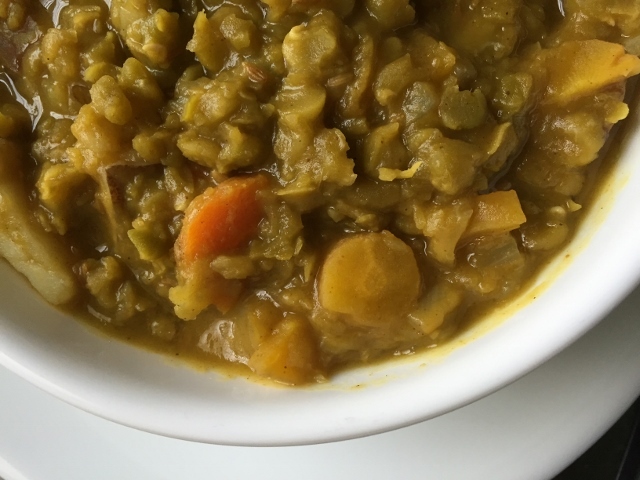 A double batch of this Curry Split Pea Soup that I made earlier this week has been feeding us as well. We have enjoyed it over baked potatoes or with a rice medley added to it for a different texture and flavor. Its a Lorna Sass recipe and you can print it here. I have also made this recipe with yellow split peas and I always up the spices! 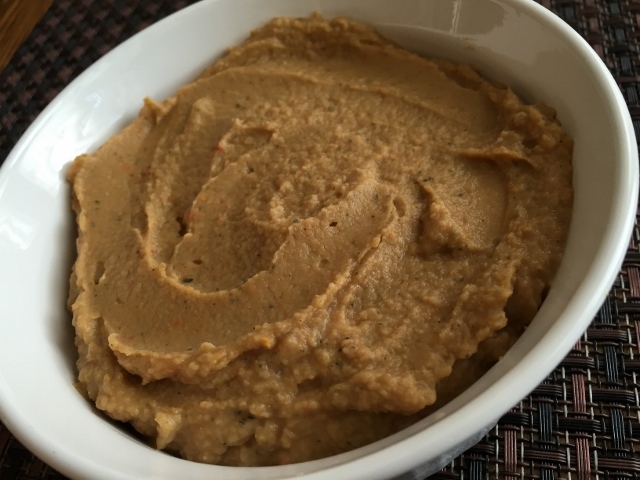 We have also been enjoying Sharon McRae’s Pizza Hummus this week with veggie dippers. You can see Sharon’s recipe here. To help cut down on time spent in the kitchen I often double recipes and freeze them in 2 serving portions. I always have at least half a dozen soups frozen that we can thaw out for an easy meal. They can be served over rice, quinoa, baked potatoes or a bed of greens to make them more filling. Add a bowl of fresh fruit and you have an awesome meal. Making a double batch of bean burgers, loaves or BBQ Lentil Muffins really doesn’t take any more time than making a single recipe. Then once cooled they can be individually wrapped and frozen. Check out my favorite bean burger recipes here. With the addition of oven fries a salad or some other type of veggies you have a quick and easy meal in minutes. When I make a big container of brown rice or quinoa once it has cooled I put it into freezer bags in 2 cup serving sizes. Then when I need some I pull out a bag or two and it thaws quickly on the counter or in the microwave. I buy the pre-washed organic spinach and baby greens and that is such a time saver. When I get home from the store or Farmers Market with my little salad tomatoes, fresh herbs and such I like to go ahead and wash them, lay them out on towels to dry so they are ready to use. It saves me time later when I might be rushed. Once you get the hang of it this way of cooking and eating is so simple and easy. Please feel free to share with me your food prep hints and tips. I am always looking for ways to make things easier and free up time in the kitchen. I wish you lived closer Jody – I would help you food prep! I love this visual… so helpful. I have a question though- I’ve avoided making the brussels sprouts because I hate mustard. Any suggestions for a substition? Hi Patti – The first thing that comes to mind is perhaps a little tomato paste – it has a similar texture – I haven’t tried it but I think it might be good. Of course you could just use Balsamic vinegar and some no salt seasoning and see how you like that too. If you try it let me know how it works. Terrific post. 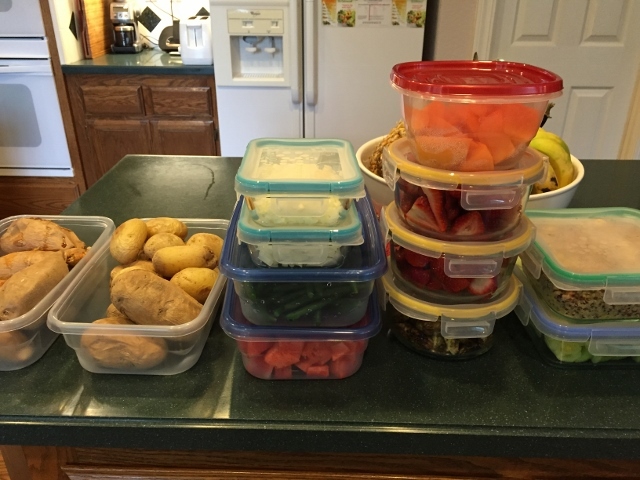 It is always helpful to see what food prep actually looks like. How many people are you feeding from the amount of food you have made? I am glad you liked it Cyd. This is the amount of food I make for my hubby and I. Our adult son is living with us right now as he is in between apartments so the food is getting eaten faster. He isn’t a plant based eater but since I don’t cook meat he eats what is here and for the most part he likes it. Hubby and I usually eat three meals a day at home so we go through food fairly quickly. We are very active so my husband needs a lot of food! So, despite cooking for years, I still don’t know some of the basics. Made 3 batches of the green beans timed like you advised and now have a wonderful sampling to take with me away for the weekend and something that will await me when I get home. I think you just saved every holiday for me as well..Boy am I sure glad you came into my life!! Lani I am so delighted that my technique works for you! Its a great way to cook them and so easy too. I like easy these days. You are so sweet – I love your positive attitude! BTW, what is your favorite dressing? 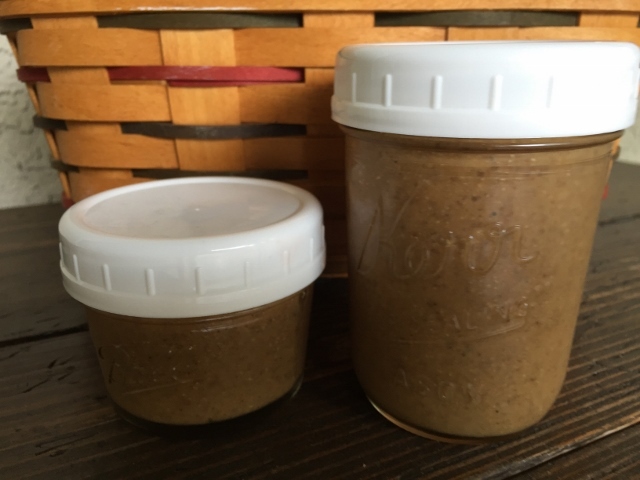 Lately I have been making Wendy’s Light Balsamic dressing from the recipe section on the facebook page. I reduce the water by 1/4 cup and use 1/2 cup of balsamic dressing and add some no salt garlic and herb seasoning to it. It has a nice tang to it and is a good substitute for the Fuhrman Balsamic dressing I use to make but it has cashews in it! What dressing do you like? Tami, you have been on your new plan for a while now, so I would like to ask you a few questions about how you compare the Ultimate Weight Loss plan to Nutritarian. Have you lost weight that you couldn’t lose as a nutritarian? Do you feel the same or better? What about your energy level? Do you eat any nuts or avocado? I think that all of the starches (potatoes) would not be good and Dr. Fuhrman says that some fats are needed to absorb the nutrients in the vegetables and other foods. Personally, I have had great success with his plan, but still have those last stubborn 10 – 15 pounds to lose. Your food prep REALLY impressed me and reignited my interest, so I’d love to know the results that you have experienced. When I first started eating plant based I did follow the Nutritarian food plan. Soon after I also started reading other books like Engine 2 so I was doing a blended plant based diet! I did lose weight initially. Not long after going plant based, although my diet hadn’t changed and I was still hiking, walking, biking and exercising I started gaining weight. Eventually – about a year later I was diagnosed with hypothyroidism. I was feeling tired all the time, couldn’t lose weight no matter what I did or how little I ate. I was still eating a plant based diet but the weight wouldn’t budge. I had to start taking a synthetic hormone. Slowly I started to feel better – it took months. I found myself 20 pounds heavier. Then I started Chef AJ’s Ultimate Weight Loss Program and my life changed! Her food plan is based on a whole foods plant based diet, salt, oil, sugar, flour, dried fruit, nuts and avocado free. Finally I started to lose weight! My energy started to come back and now I feel better than ever. I have lost almost 20 pounds and still going! Yes I do feel better. I do not eat nuts or avocados. I eat plenty of potatoes,baked potatoes and rice as well as beans,lentils, two pounds of veggies a day and about a pound of fruit a day. I am losing weight and shrinking! There is fat found naturally in plant based foods. Starches fill you up and are satiating.I was shocked at what a difference having a potato or rice with a meal made in how full and satisfied I felt. Chef AJ recommends reading Dr McDougall’s Maximum Weight Loss Book to learn about why starches are so beneficial for weight loss. It is an area of whole food plant based eating that Fuhrman and him disagree on. The proof is that it is working for me and about 300-400 people on the UWL program! I am beyond happy with my results – and both my husband and I love eating this way. Once I get to my goal weight I may be able to add back in a small amount of tofu, nuts or avocado that I don’t eat right now. I will just have to wait and see how much food my body can handle without gaining weight. I won’t be adding back in any flour or sugar as they are triggers for cravings for me. For me I would rather have a potato with my meal or as a snack than to have an ounce of nuts. The potato is filling in a way that those nuts are not. My cravings for off plan foods are gone – it’s like magic! This just seems to be the perfect combination of foods for me and is so much easier for me to follow than the Fuhrman food plan. I eat more simple meals and spend less time in the kitchen. Its wonderful! I would love it if you decided to join us to get those last pounds off! Thank you so much for your lengthy and informative answer! I really appreciate your taking the time to do that for me. I am definitely going to try the Ultimate Weight Loss Plan. I, too, have read other books and even attended an Engine 2 conference as well as two Fuhrman Health Getaways. Do you still eat beans? What do you use for a salad dressing? We love one from the Fuhrman site, but it has lots of cashews. Again, thanks for your help. You are welcome Eln. I do eat beans or lentils everyday – they are a large part of this food plan. There are a list of no oil, no nut salad dressings on the UWL private facebook page and I love the Light Balsamic dressing recipe. I believe that the low fat food plan we follow is really helping people to lose weight. I look forward to seeing you on the UWL facebook page! How do you make the light balsamic dressing? Is that the recipe you use make with white beans? Hi Eliz, yes the light creamy balsamic dressing is the one made with beans. Delicious! Your post was awesome! After being vegan for 2 years and WFPB since April, I’ve discovered that I need to do this simply rather than cooking difficult meals on the weekends but instead save them for special occasions. I would definitely love more posts like this one and I thank you again! I am glad you found this post helpful. Yes I agree with you that the complicated recipes can be saved for special occasions. The simple meals are just as satisfying and take a lot less time to prepare and clean up after. I will do some more food prep posts in the future.